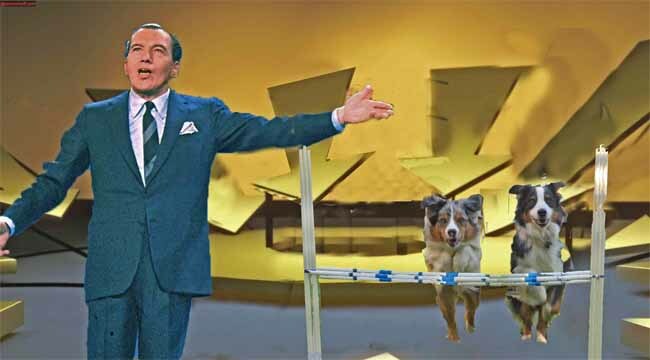 ED SULLIVAN ON CROSSCURRENTS, 9/28 – Doggedly Yours… Howling, Humor, and History. ED SULLIVAN ON CROSSCURRENTS, 9/28: Remembered for hosting the 23 year-long television variety show which would be renamed for him,, Ed Sullivan was born on this date in 1901. Gavin and Wyatt rehearse their act under the watchful eye of Ed Sullivan. With a soundtrack of tunes from artists who appeared on the Ed Sullivan Show, his birthday necessitates a “really big show” hosted by John on Crosscurrents, 9/28 at 8 am.